Marginal Returns Is A New Project From Andrew James Gustav, Sharing Music By Close Friends And Artists From The Margins Of Electronic Music. Its First Release Is The Vinyl Debut Of Two Phase U, Real Name Hernán González. Based In Uruguay, González Has Been Producing Music For Over 20 Years, In Parallel To The Growth Of Montevideo’s Now Vibrant Electronic Music Scene (centred Around The Esteemed Club Phonotheque). Two Phase U’s Last Output Was The Recently Rediscovered 1998 Album ‘techknowledge’. 20 Years Later, González Has Resurrected The Alias To Explore Fresh Interpretations Of That ‘golden Age’ Of Electronic Music. 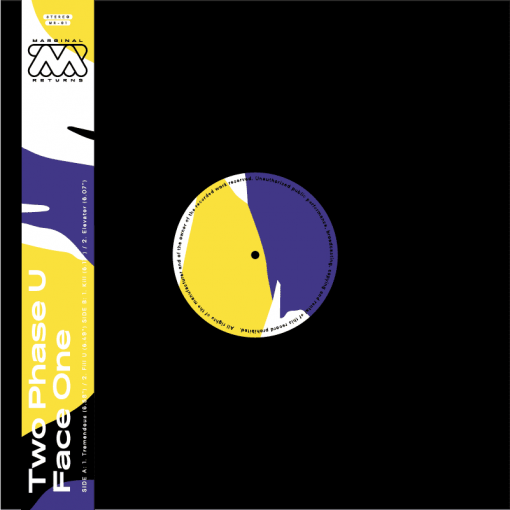 ‘face One’ Presents A Brighter Side Of The Two Phase U Sound: The Technicolour Tumble Of ‘tremendous’, The House Lilt Of ‘fill U’, Electro Boogie Tinged ‘elevator’ As Well As The Darker, Snaking ‘kill’. More items from " Marginal Returns "
More items from " Two Phase U "